Job listings for composers, lyricists and writers. The Victorian Hotel pushes the envelope on the theater stage. 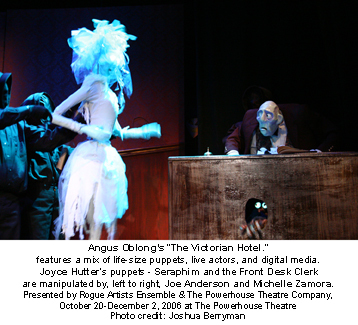 SANTA MONICA, CA - If searching for a play on ghosts mixed in an extremely clever use of puppets, then search no more. 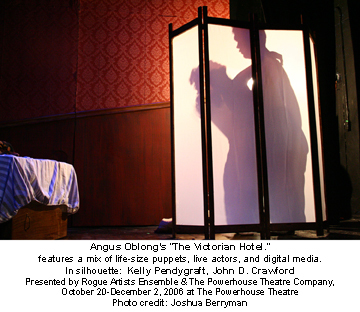 Premiering at the Powerhouse Theater is Angus Oblong's new play The Victorian Hotel. Fans familiar with Angus Oblong are already aware of his twisted sense of humor. For those not familiar, it is strongly suggested that you buy a ticket and to expect the unexpected. Directed by Mark Valdez, The Victorian Hotel tells the ghostly tale of a young couple as they check into a weekend getaway hotel. However, the hotel is filled with ghosts from top to bottom –These delightful and frightful ghosts have agendas all their own, which places the lives of the new guests in jeopardy. The show brings spirits to life with the most excellent use of puppetry. Puppets that are very faithful to the vision of Angus Oblong’s art. It’s this showcase that seemingly deserves an award of some kind. In terms of story, The Victorian Hotel has the best act one in town: hands down. As soon as the show begins, the audience is zapped into this creepy story. The ghosts are captivating to watch and literally steal the thunder from the mortals. At intermission, it is strongly suggested that children under the age of 16 go home or visit the local ice cream store just around the corner with a supervised adult. Angus Oblong’s story of endangered and manipulated mortals travels down a dark sexual path. True to form, Angus Oblong has obviously tried his best to stray from the norm. There are some acts displayed on stage that are a tad too twisted to discuss. Those who are not used to such situations will no doubt sit in silence and wonder what happened to the show that was being presented before intermission. Kelly Pendygraft and John Crawford are strong performers as the seemingly happily married couple Claudia and Winston. They play extremely well off each other and display wonderful comedic timing. The Dead Girl, played by Michelle Zambora, has proved to be an early audience favorite. Another hilarious standout is the Bellboy Ghost played by Radick Cembrzynski. 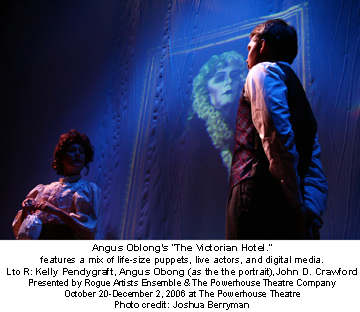 The Victorian Hotel is to be seen for its inventive storytelling and the display of art from Angus Oblong. 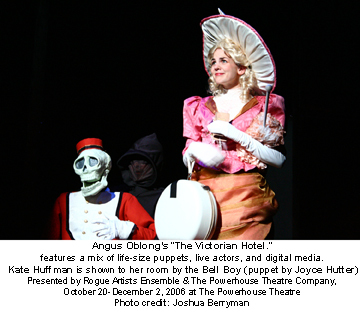 Buy a ticket, and allow yourself to enter the haunting and hilarious world of Angus Oblong. The Victorian Hotel is ghostly fun. Presented by the Rogue Artists Ensemble, in association with The Powerhouse Theatre Company, The Victorian Hotel performs at The Powerhouse Theatre, located at 3116 2nd Street in Santa Monica, CA. Running through December 2nd, performances are Thursday thru Friday at 8pm, with Matinees on Saturday at 2pm. General Admission is $25.00. Call for student, senior and group discounts. Adrian Rennie, staff writer and editor for Maestro Arts & Reviews, is an actor and Los Angeles area playwright. Having received great reviews for his plays, The Seven Lessons of Life and Only a Phone Call Away, he continues to write and act in Los Angeles Theater, Television and Film. Copyright © 2006 [The Maestro Group]. All rights reserved.